Brief Synopsis: While Eclipso attacks Metropolis, Superman becomes trapped in an alternate dimension. 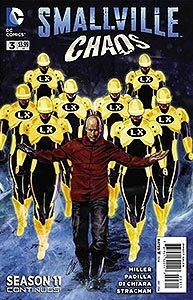 Issue Notes: This book was originally released online at Comixology.com in three installments (Chapters #7-9) for 99¢ each. The only difference in content between the print and digital releases are the inclusion of advertisements in the printed edition. Story Notes: This mini-series continues the adventures of Superman from the series Smallville Season 11. 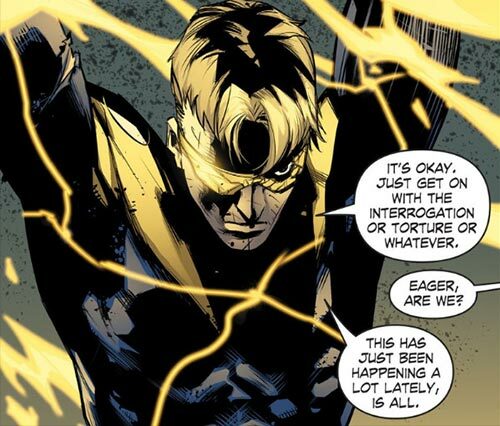 Despite being tortured by Lex Luthor's Yellow Lantern-goons, Booster Gold manages to remain defiant. Booster's quip, "Please sir... May I have another," appears to be a paraphrase of dialogue in the movie Animal House, where Kevin Bacon's character is being initiated into a fraternity with a spanking. Booster Gold and Lex Luthor obliquely discuss the Greek myth of the inventor Daedalus and his son Icarus. According to myth, the pair tried to escape from prison using wax and feather wings of Daedalus' design. Icarus rashly flew too close to the sun which melted his wings, and he plunged to his death. Skeets spies on Booster and his fellow captives. This is the final appearance of both Booster and Skeets in this issue.